An enjoyable ramble in the lower Wharfe valley from Weeton to Netherby Deep before a fine return along the banks of the River Wharfe. The day before this walk my wife and I had taken advantage of our daughter staying at her friend’s house to enjoy an afternoon of shopping in Leeds before a meal and a trip to the cinema (the excellent ‘Stan and Ollie’). We decided to go on the bus and on the way we crossed the River Wharfe at Harewood Bridge. It reminded me that sometime ago I’d planned a walk along the riverbank either side of the bridge. I’d never got round to do it, partly because of the lack of hills, but also because I was convinced I’d come across a lot of cows. With the following day forecast to be cloudy and with most cattle taken in for the winter it occurred to me that a low level walk would be the perfect option for the next day. So it was that on Sunday morning I parked up alongside a small green in the sleepy little village of Weeton. To my recollection this was the first time I’d actually been in the village proper. I’d been through Weeton station many times but that is situated a mile or so to the north in Huby. From the car I walked past the ‘Old Hall’ and an old chapel that has been converted into a residence. Next to the latter was an old red telephone box. Heading down Main Street I then turned on to Brook Street. At the road corner I was delighted to see my first snowdrops of the year. Near the end of the road a grassy path, enclosed by fences, led me to the buildings at Meadowbrook. The way through the buildings is not quite as shown on the map but is fairly well marked. A quite narrow gate by a stable was slightly awkward to negotiate especially with a curious horse leaning out to have a look at me. On the other side of the gate I crossed Weeton Beck on a footbridge to reach open pastures. There was no path as such, instead I gradually made my way to the top left hand corner. Along the way I came across the sad remains of a tree with just two sections of trunk remaining. 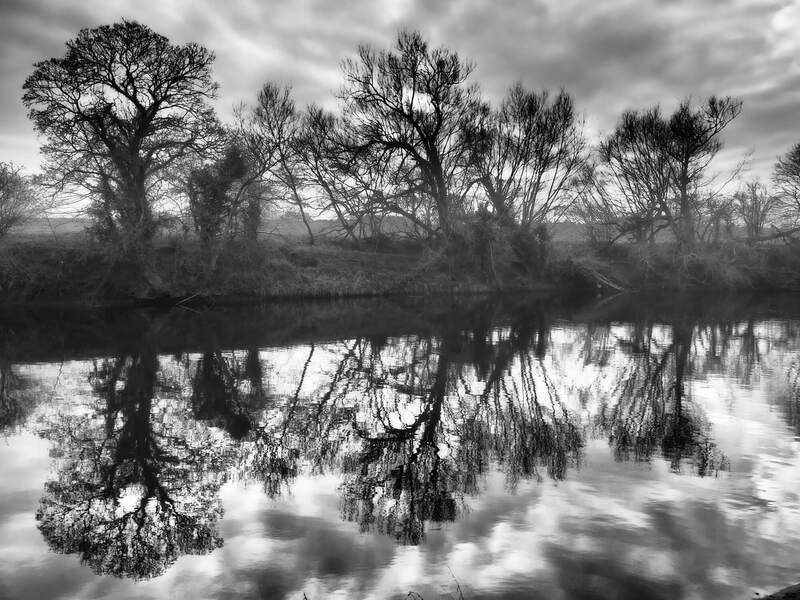 The murky cloud provided good conditions for some atmospheric black and white photos looking back at Weeton. Also fairly prominent was the major landmark of Almscliff Crag away to the left. At the top of the field I crossed a stile and then more steeply up alongside a fence to reach a minor road. Called Green Lane I turned left to follow it up towards the top of Healthwaite Hill. After a short while it changed from a metalled road to a rutted track. Lined with trees either side I really enjoyed this section. Bending round to the right I continued to follow Green Lane as it finally descended to the A61. Carefully crossing this busy road I then walked over a sheep pasture to a small bridge over Keswick Beck. On the other side I climbed gently uphill to reach Swindon Hall. The present house apparently dates from the 1830’s though the fine old gateposts date back to a Jacobean hall. That had in turn replaced a medieval hall that was destroyed in the Civil War. It seems there is quite a bit of history at Swindon Hall. From Swindon Hall I joined the nearby road, Swindon Lane. Turning right on this I walked along the road to reach a junction. Taking the left turn, Spring Lane, I then commenced a good mile or so along the road to Netherby. Fortunately there weren’t many cars and in about 20 minutes I reached a crossroads with an old West Riding sign next to it. Even more interesting were the dozen or so red kites soaring overhead. After being persecuted into extinction in England by the end of the 1800’s these magnificent birds were re-introduced on the nearby Harewood Estate in 1999. Their reintroduction has been a huge success and there are now over 300 red kites in Yorkshire. The area around Harewood is still the best place to see them. On the other side of the crossroads I took a narrow path down the side of a holiday park to arrive on Wharfe Lane. Just to the left I then took a path to the side of Wharfe Hill Farm. The path soon brought me to the sombre spot of Netherby Deep. The placid waters hide the fact that the river is around 30 feet deep at this point. Quiet today this spot was once also known as Kearby Sands. Sand was apparently imported from Bridlington to create a sandy beach on the riverbank and it was a popular spot in the fifties and sixties for picnicking. This notice was erected by the grandfather of 8 year old twin boys who lost their lives here. They were last seen by the water edge. Five hundred people were here but nobody saw anything. If you care for your children please take them away. Avoid this place as you would a plague. A thread on the Secret Leeds website quotes a 2008 article in the Ripon Gazette which relates what happened to the twins, Andrew and Stewart Nicholson of Leeds. They had been taken there by their parents on June 9, 1963. While the parents sunbathed the two boys played at the water edge periodically returning to their parents. Then as the sign says, they simply disappeared. They were later found by police frogmen 25ft underwater. It is a very sad tale though at the time of the walk the first I knew about it was when I read the sign. I stopped at the bench for a quick bite to eat but after reading the sign I didn’t fancy hanging around this spot. Fortunately the next few miles of riverbank walking were hugely enjoyable. This, combined with the sun making an unexpected appearance, helped lift the gloom, both real and metaphorical. The walk along the riverbank was interrupted by the A61 at Harewood Bridge. With care, as it is a very busy bridge, I walked on the narrow pavement to look over the bridge at the weirs below. I was also delighted to find an Ordnance Survey benchmark with Harewood and Dunkeswick signs fixed either side of it. On the other side of the bridge the next feature of interest was a small weir where a mill used to stand. Finally, after a fine hour or so of riverbank walking some steps climbed up away from the Wharfe. The path then led me into the woods of Rougemont Carr. These woods were once the site of Rougemont Castle and is an English Heritage Conservation Area. According to the Historic England website, Rougemont Castle is a good example of a well-preserved ringwork. Today the site is completely wooded and so it is almost impossible for anyone without a trained eye to see anything. It is hard to imagine this was once the centre of the Harewood estate until it was abandoned in c.1366 in favour of Harewood Castle. On the other side of the woods a field led me to a nice little packhorse bridge over Weeton Beck. A track then led me past a small sewage works to reach Gallowgate Lane. Turning right on this I then took a path crossing a couple of fields to reach the opposite side of Gallowgate Lane’s loop. Turning right I then paid a visit to the Church of St Barnabas. With a magnificent spire the church had been a big feature of the early part of the walk. In the churchyard there was a memorial to the 12 people who died when Knight Air Flight 816 crashed at nearby Dunkeswick Moor in 1995. From the church it was then a simple walk back to the car. Not only had the weather turned out much better than forecast but I also enjoyed the walk much more than I expected. Once past Netherby Deep the riverbank was delightful. There was a great deal of historical interest too and it is always a pleasure to see the red kites. All in all highly recommended.